See how global warming will impact you. One of the reasons for this discrepancy may be that discussion of climate science tends to happen at the 30,000-foot level — examining global shifts in average temperatures and weather — or focuses on extreme environments, like the Arctic, where the impacts of climate change are most extreme.But climate change is going to impact every corner of the Earth in some way or another. That’s why the National Oceanic and Atmospheric Administration’s slick new online Climate Explorer is so fascinating. 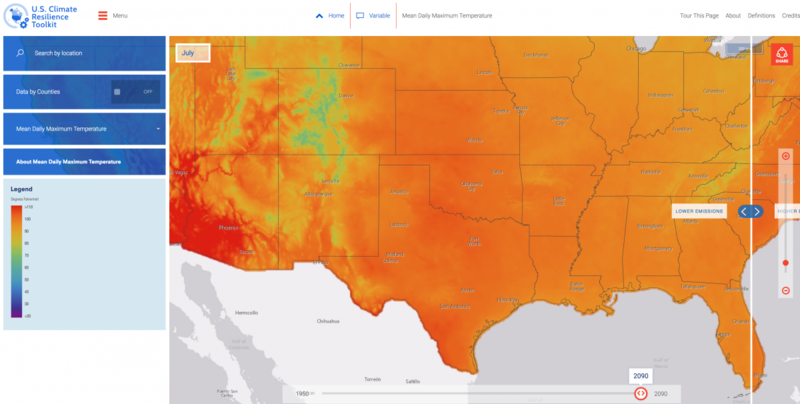 The updated system lets you zip across the 48 contiguous states (and Washington DC), and see for yourself how the local climate in any given neighborhood is likely to change between 2010 and 2100. 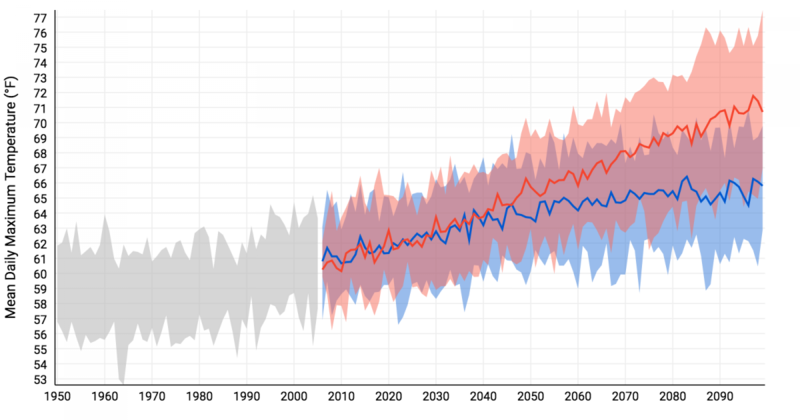 The Climate Explorer also includes data on how the climate has behaved between 1950 and 2010; scroll forward in time, and you’re seeing data pulled from international climate models. NOAA’s site plots out changes according to two possible futures — one in which global emissions peak in 2040 and then begin to decrease, and another in which emissions keep increasing apace. Take a look. 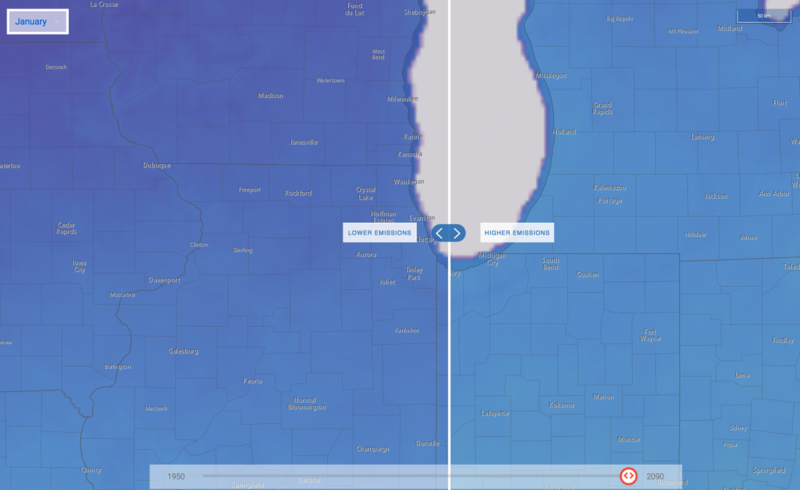 The first thing you notice when tooling around in the Climate Explorer is how dramatically different the first scenario looks from the second. This image swipes back and forth between the two scenarios in a map of the country in 2090. Darker shades of red indicate more days each year above 95 degrees Fahrenheit. That darkest red, visible around Phoenix, Arizona, as well as parts of southern Texas and Florida in the high-emissions scenario, indicates as many as 225 days over 95 each year. But this isn’t just a tool for looking at the whole country. It’s a tool for thinking about your town. Zoom in on Cherry Hill, New Jersey — the town I lived in as a kid — and a chart pops up. The chart shows the difference between the two scenarios. The red area indicates the range of possibilities for the higher-emissions scenario, and the blue area indicates the range for lower emissions. Those lines down the middle indicate the most likely outcomes. 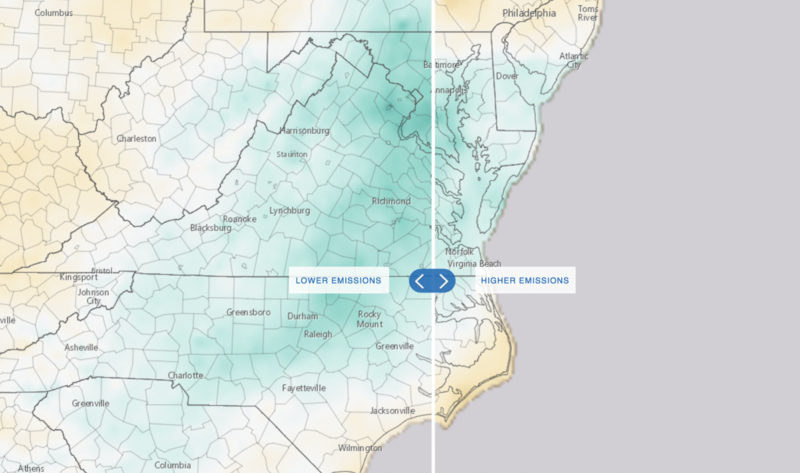 You can see that for Cherry Hill, the difference between high and low emissions amounts to about 50 days with highs over 95 degrees each year by 2090. That’s a lot of dangerously hot weather. But the map isn’t just good for examining changes in heat. 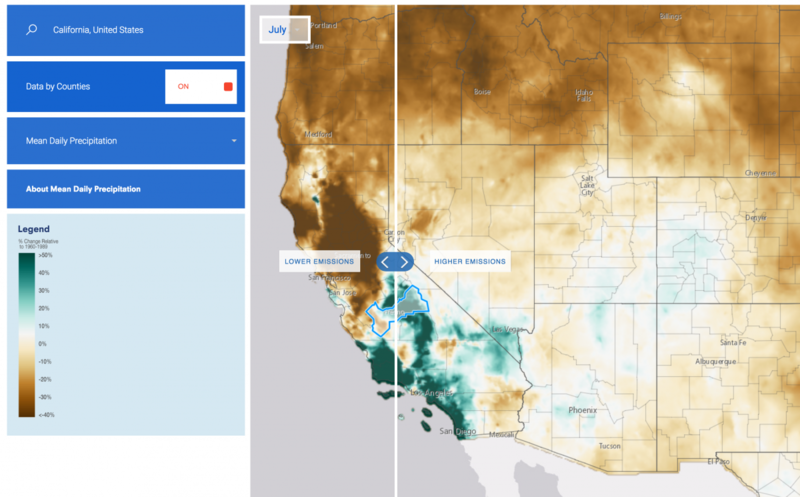 Here’s what happens when you look at changes in precipitation in the West. You can see the northern Rockies and Pacific Northwest turning brown in both scenarios, signaling they’re likely to get much drier. But California shows the most dramatic impacts to precipitation. Look at that deep brown in Northern California, where the climate is expected to dry out. Then flick your eye down to deep green Southern California, expected to get a whole lot wetter than it’s been historically. The other area expected to get a bit wetter over time, particularly in the lower emissions scenario, is the mid-Atlantic. The change is nowhere near as intense as in California, however. The tool also lets you explore what average temperatures are likely to be during four months of the year: July, October, January, and April. Here’s how the region around Texas looks in 2090 in the high-emissions scenario. And here’s the low-emissions scenario. 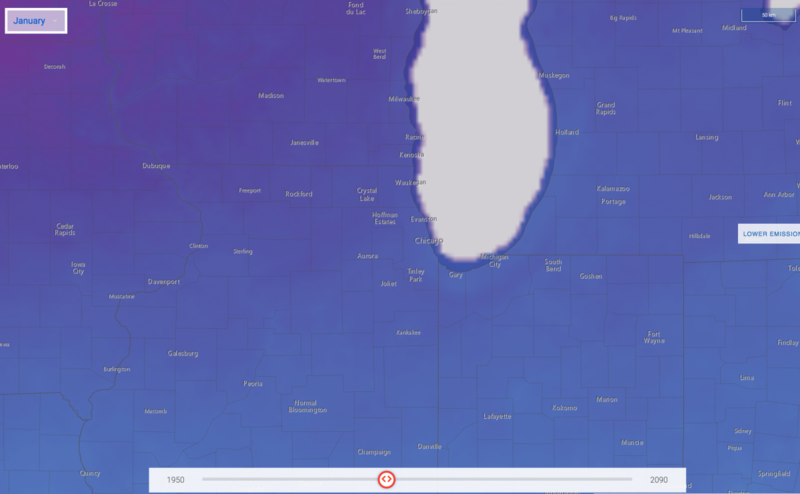 The tool also shows how winters are expected to change over time. Here’s what winter in Chicago looked like in 1970. 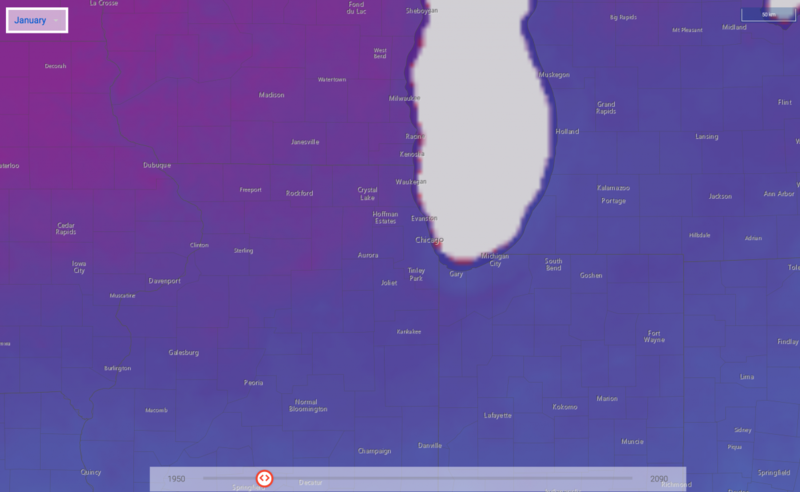 The darkest blue indicates deep subfreezing temperatures — highs of 20 degrees or lower. As it gets lighter, we’re in the territory of 32 degrees — highs right around freezing. Some counties in these scenarios, particularly the high emissions scenario, show average highs above freezing in January. That’s a major shift for the region, with potential impacts on local life, ecosystems, and economies. And here’s what all that data for Cook County’s average daily maximums in January looks like on the chart. You can find your own hometown in the explorer on NOAA’s website by clicking here.